Arise, Sir Ringo! Why there's much more to the Beatles drummer than just a backbeat . Beatles Radio: The Beatles, Solos, Covers, Birthdays, News The Fab 4 and More! The news has leaked that Ringo Starr is to receive a knighthood for services to music and charity in the New Year Honours List. At the age of 77, he will become the second of The Beatles to be knighted after Sir Paul McCartney, some 52 years after the Fab Four were honoured by the Queen with MBEs. John Lennon famously sent his back to Buckingham Palace in 1969 in protest against Britain’s support of America in the Vietnam war and over UK involvement in the “Nigeria-Biafra thing”, as he called the civil war in that country. WASN’T STARR THE WACKY ONE? 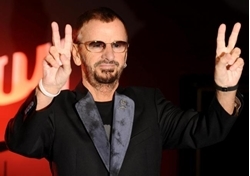 RINGO coined the phrase A Hard Day’s Night, which became the title of The Beatles’ No.1 hit. His fine comedic performance in the film of the same name showed that he could act, sing and play his drums, about which more later. It also showcased his outgoing personality, and he went on to have the central role in the second Beatles film, Help!